This is a vastly comprehensive iPhone and iPad app which has been designed to provide you with unfettered ad-free access to America’s most useful and respected dictionary and thesaurus courtesy of the world renowned Merriam-Webster. Having been developed in collaboration with Merriam-Webster, it should go without saying that this is obviously a very high-quality development with some great attention to detail and a truly immense amount of content. This app is a very apt digital version of the dictionary and thesaurus, and with all the additional features that are on offer you’re sure to find exactly what you need to satisfy your linguistic needs every day. This is a gem of an app so be sure to check it out! This is the paid, ad-free version of Merriam-Webster Dictionary & Thesaurus, providing unlimited access to a vast dictionary and thesaurus complete with all manner of content including quick definitions and example sentences. You’ll even find audio pronunciations so that you don’t make a fool of yourself when learning new words! I also really like the way the developer has incorporated voice recognition into the app so that you can search for words and phrases by simply speaking into your device’s microphone. Every day you’ll receive a new Word of the Day. I really like this feature because it’s a great way of learning some new words, and boosting your vocabulary in a relatively fun and casual fashion. In addition to all of this, you’ll be pleased to know that you can also add your most frequently used words to your Favorites list for quick and easy future reference. This is ideal for learning a new word and then keeping it close to hand for a few days so that you don’t forget about it. What’s more, you’ll also find foreign words and phrases that are commonly used in English as well as biographic and geographic entries where relevant. 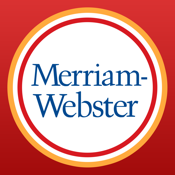 Merriam-Webster Dictionary & Thesaurus is a powerful addition to the Reference category of the App Store and a great iPhone and iPad app through and through.